El Camaleon Golf Club | GolfTrip.com - Golf Tips, Vacations, Packages, Destinations and more! 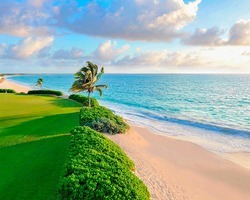 Located at the Fairmont Mayakoba Resort, El Camaleon Golf Club competently exhibits a unique layout with a landscape that blends with the tropical jungles, dense mangroves and magnificent ocean front, stretching the sand towards the bordering massive limestone at each hole. The man behind this genius is Greg Norman, the pre-eminent player who won more than 60 titles around the globe. Norman used indigenous and environmentally friendly designs aspects as main inspiration for this golf vacation course. The principles show evidence on the imposing cenote of the opening fairway. Such ancient underground cavern was unearthed during the first stages of the construction. Apart from the mentioned, El Camaleon Golf Club shows ingenuity as its two holes position merely steps away from the Caribbean Sea. That gives golfers a challenging shot to take, while offering intimacy on the historic body of water. The 15th hole, playing directly towards the vibrant waters, defines the golf trip experience here, as the 170 yards from the back with large green set the atmosphere, while the waves softly relieve a golfer’s anxiety. But take note, this hole should not be taken for granted because the moody tropical winds would eventually push golfers into a challenge. The amazing features of the course has never failed to stand out. In fact, in 2007, El Camaleon Golf Club became the first golf course to host an official PGA TOUR event in México and the first official PGA TOUR event ever held outside the United States or Canada. Complementing the fame are facilities specifically showcased by the Mayan influenced clubhouse. Standing at the 18th green, the clubhouse includes golf vacation packages such as five star practice facility and driving range. Speaking of driving, the course also has innovative canal system that allows golfers to ride a ferry from their accommodations to the first tee.